Whilst having a rummage around looking for something else, I came across some of my poster originals which I produced to advertise events and open days at my railway, the Little West Narrow Gauge Garden Railway. The posters were all done by an old-fashioned cut-and-paste method using Letraset and Econosign stencils, with hand-drawn illustrations all stuck down with UHU-stick glue onto A3 style-sheets and then photocopied. By adjusting the lightness of the copier one could eliminate the shadow lines created along the many strips of paper which made up each poster. The originals which I’ve scanned here have been cleaned up in Photoshop to show how the posters would have looked when presented. The first is for the 1989 Open Day and although an A3 original, the copies were reduced onto day-glo or bright-coloured A4 paper to stand out when shown in local shop windows and other places in our immediate vicinity, telegraph poles, bus shelters etc. The second poster is more of a leaflet and although designed on A3 paper would never have been printed that size but at A4. My target audience were railway societies and other enthusiasts and copies would be sent to all the well known clubs who might be interested in publicising my Open Days. 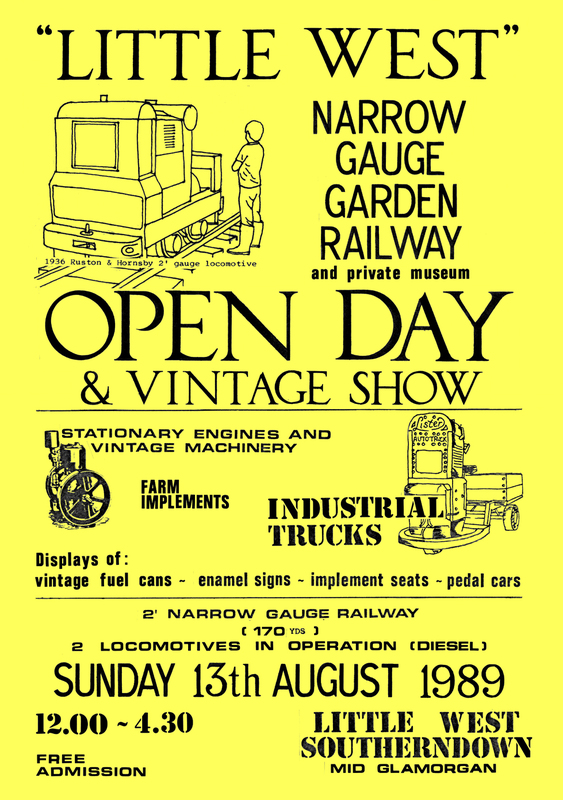 In reality the most popular open days were always New Year’s Day and our mid August event, the latter usually held with visiting exhibits as indicated on the 1989 poster above. 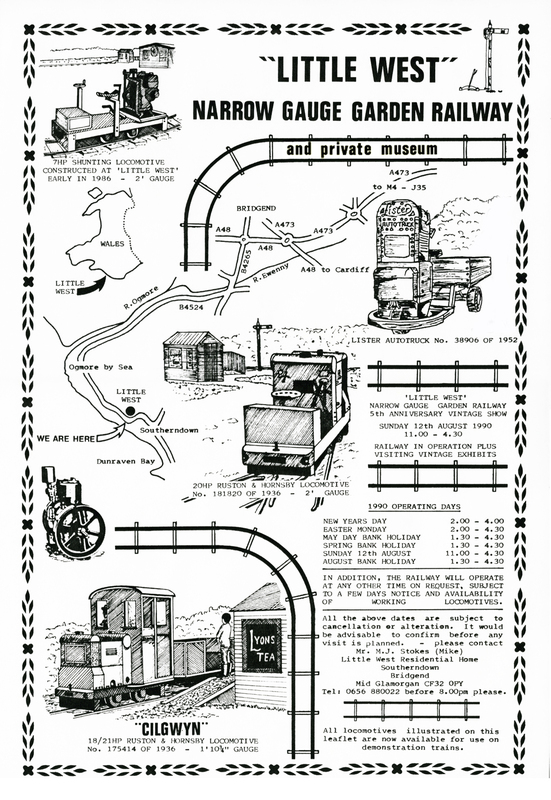 By 1990 there were three locomotives on the railway, the fourth would arrive after this poster was designed. 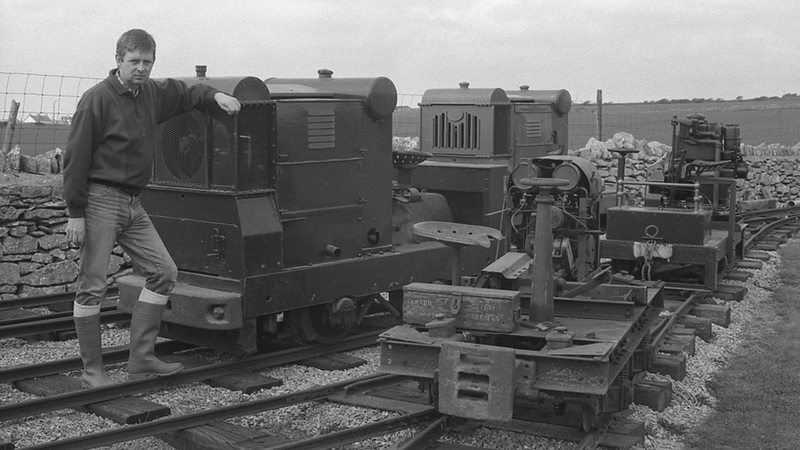 I would also show the railway to anyone that telephoned in advance to make an appointment to view, members of the Branch Line Society were usually the most interesting visitors as they always insisted on travelling every inch of the line, even to the farthest end of the loco shed and all the locos would have to be shuffled around to accommodate their requests. Normally we would not carry passengers, we discontinued that after the 1989 Open Day when we had a derailment resulting in the necessitation of replacing all the rail on the curved sections with a heavier gauge; I used to allow organised parties to travel and also drive the locomotives provided they had previous experience. I expect you’re all curious now and want to have a look at my train-set? This is the complete set of locos in 1992 and as it’s in February I can only assume visitors were imminent as two of the locos were extremely difficult to start in the winter. I’m leaning against the front end of 1936 Ruston & Hornsby 16/20hp No 181820 which I acquired from Toddington narrow gauge railway in Gloucestershire and now at the Old Kiln Light Railway in Surrey. Behind that is another 1936 16/20hp Ruston & Hornsby No 175414 now at the National Museum of Wales, Llanberis Slate Museum. Nearest to the camera is Lister Railtruck No 962 of 1926, at the time this was the oldest known survivor and is now privately owned in Staffordshire, and behind that is the locomotive I constructed myself in 1985, now at a private railway in Gloucestershire but much modified, the frame forming the basis for a passenger carriage. LWNGGR 1985-2005; the railway was fun while it lasted!